To whip our sorry summer nails into shape, Louise and I have trialled the brand new Nailtiques Nail Lacquer with Protein, a collection of nail colours infused with the same protein blend as the awardwinning Nailtiques nail treatments. The combination of colour and treatment is the perfect solution for someone like me – I’m neglectful with nail care, but I’m all over nail colour. The treatment works by penetrating the nail bed, giving nails a dose of reparative and strengthening power. They’re left feeling strong and healthy, and your nail colour looks bright and glossy. I trialled Havana, a deep and dark burgundy hue, and Rio, a sweet candy cane pink that is perfect for the summer. 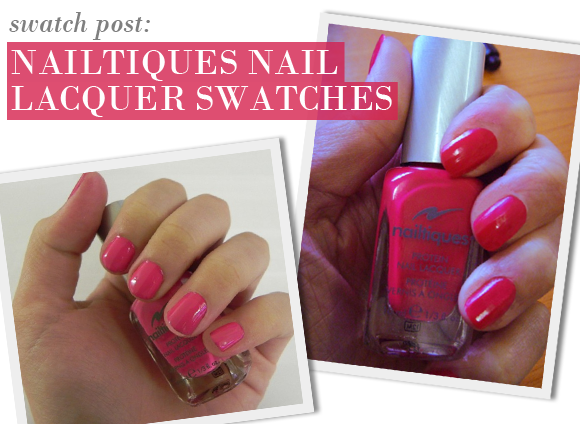 Louise had a go with the tropical pink of Tahiti, and the putty colour of Cairo. The formulations were incredibly glossy and gorgeous – especially Havana, you can almost see the reflection of the camera in that picture above! The colours were pigmented and true to the bottle, and applied like a dream. What I was most impressed with was the quality of my nails. They felt stronger and were definitely less prone to bending and splitting, and I was able to grow my nails a little longer than their usual bitten-to-the-wick state. I’m mightily impressed with the longevity and the hard-wearing qualities of the Nail Lacquer too, and would highly recommend them for those with troublesome nails. My nails were in a terrible state - soft and peeling layers almost half way down their length. Eventually started with Nailtiques Protein Formula which did an excellent job. Now, having decent nails, I wanted to wear nail varnish but was worried about it having a detrimental effect on my lovely 'new' nails. Having heard about Nailtiques NailLaquer with Protein I found it here. It is GREAT. I have super colour on my nails but am still treating them with the formula. I use Formula 2 as a base and top coat with two coats of colour between. Every other day I top up with a coat of Formula 2 until I take it all off and start again. I can see myself having nearly all the colours! And I've had so many compliments about my nails. Definitely a winner - I can highly recommend this product. This entry was posted on Wednesday, July 20th, 2011 at 8:43 am and is filed under Make-up, Swatches, Tried & Tested. You can follow any responses to this entry through the RSS 2.0 feed. You can skip to the end and leave a response. Pinging is currently not allowed.